The 2018 Burger Boogaloo happens June 30 & July 1 in Oakland’s Mosswood Park. 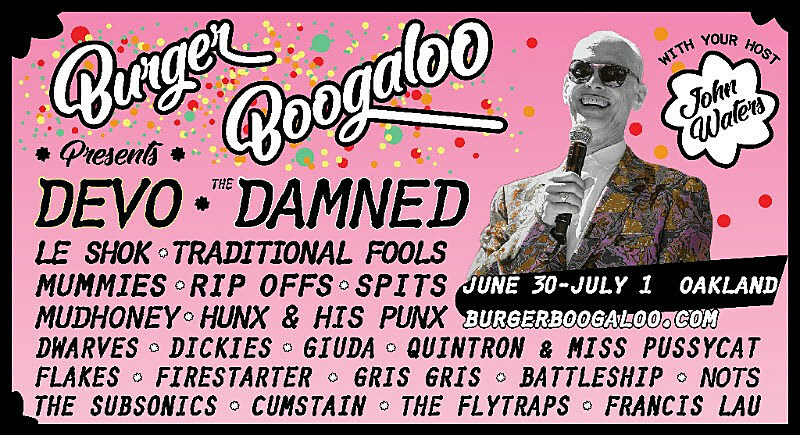 John Waters is back again as the emcee and the lineup includes Devo (their first show in three years), The Damned, The Mummies, Spits, Mudhoney, Dwarves, Guida, The Dickies, Quintron & MIss Pussycat, NOTS, and more. The lineup also features a number of reunions: West Coast electro-punks Le Shok will play their first show in 15 years; Battleship and Greg Ashley’s band Gris Gris will play their first show in 10 years; and The Traditional Fools and The Rip Offs will play their first shows in five years. Hunx & His Punx are also reuniting for Burger Boogaloo. Tickets for the 2018 Burger Boogaloo go on sale Wednesday, March 7 at 9 AM Pacific. Check out the full lineup below.